If you’re searching for insights on how to build an HO scale model railroad, then look no further. Here are a few exceptional model train layouts that can provide ideas for your own layout. Each HO scale layout is meticulous in its detail and genuinely looks realistic. These are a great source of inspiration for model train enthusiasts. It’s called the “all in one” ho scale layout because it basically contains every element of a fantastic layout. From tunnels to bridges and scenic mountains, this layout does have it all. The overall look of the model train layout is that of a dense forest. The scenery was created using a wide variety of materials and gives a strong feeling of a lush green forest with bridges that connect mountains together, large trees and even a shed. 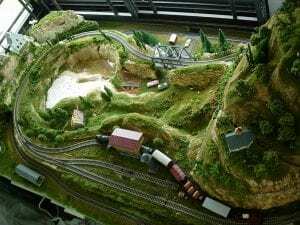 The theme can give a model train beginner excellent ideas on how to lay down terrain materials such as grass and how to realistically place trees and build mountains. In contrast to the other two ho layouts, this one stands out for being completely different but still just as realistic. The theme of the layout is of a desert that contains a bridge, switch tracks and even different gradient levels for the locomotives. It must be a pleasure watching trains move along this realistic desert landscape. This HO Scale model train layout is from Clarksburg Area Model Railroad Club. This consists of 3 main tracks with two that are DC controlled and 1 DCC. Some facilitating features of this layout are the scenery, trees and especially the mountain cliff and the three suppurate tracks ballast filled trackwork. 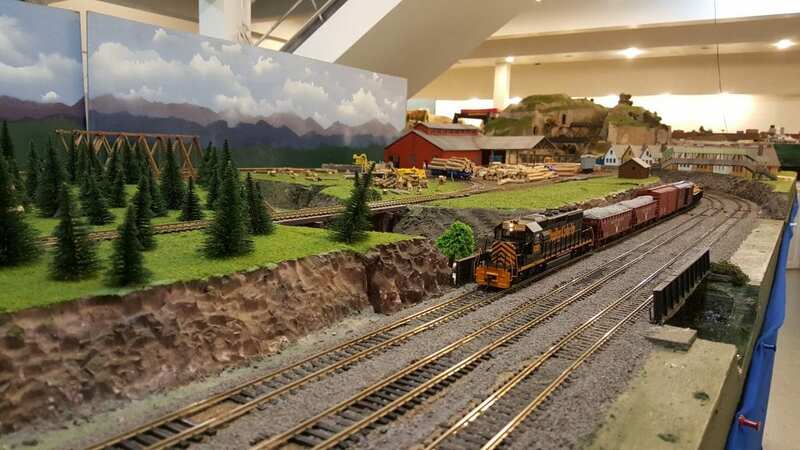 In terms of power this model railroad from the Clarksburg Area Club is using an MRC DCC controls for the operation of the cars and contains 4 loops that can have a multitude of trains on at the same time based on the DCC controls. One of the best features that sticks out is the increase per loop in height of the model train layout. The HO train layout photo looks fun with its numerous locomotives and excellent scenery and mountain display but it’s a bit difficult to tell whether this traffic jam can ever get fixed. This type of point to point HO track plan is used for industrial railway, short line or branch line. One of the special things about this 4×8 layout is the ability to be imaginative when it comes to scenery and theme. Choosing the right theme and era play a huge is making simple track plan layouts into things of beauty. 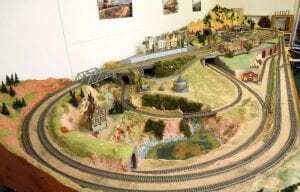 The 4×8 HO Scale Point to Point railroad has a lot to offer model train enthusiasts. It only takes a couple more sidings to add life to it, allowing for more challenging freight, commuter or mixed operations. Optimally, the mainline rises to the top of a bluff. A second unconnected line (blue track) runs below, cutting through the bluff. There are two tricky elements to consider: a switch in a tunnel and a curve at a tunnel entrance. The independent line might be a mine railway interfacing with the main line. Spurs on the main can be terminals, separate industries, and yard facilities. The bluff can be hilly, as shown, or an industrial zone or even part of an urban area. What is HO Scale Narrow Gauge? Narrow Gauge refers to any railroad that does not comply with the standard four feet and eight half inches. Narrow gauge and standard gauge are the same scale, but use a different gauge. A narrow gauge railroad has the rails closer together and is typically used in mountainous areas and forests, where there are geographical constraints. Plastic road bed tracks, there is a lot of different manufacturers making plastic roadbed track and it’s used mostly on the floor but can also be used on a bench as well. This track comes in code 100 rail and contains a wide curve to it. The Bachman EZ Track also uses huge clips to hold it together, which makes it robust when you first buy it. The main issue is that after taking it a part a couple of times the connectors can break and ruin the track. Using the Atlas True-track, the biggest drawback is the actual thickness of the track, which causes it to not be able to connect to snap track without shimming it down a bit. The Kato Unitrack uses a smaller rail joiner that is encased in the plastic connector. This allows you to literally just snap it on together without having to deal with a lack of thickness problems.